According to the 2010 U.S. Census, the population of Greater Orlando is 2,134,411, an increase of 51,990 new residents between 2009 and 2010. By population, it is the third-largest metropolitan area in Florida, the fifth-largest in the southeastern United States, and the 23rd largest in the United States. The MSA encompasses 4,012 square miles (10,400 km2) of total area (both land and water areas). The Orlando–Kissimmee–Sanford MSA is further listed by the U.S. Office of Management and Budget as part of the Orlando–Deltona–Daytona Beach, Florida Combined Statistical Area. 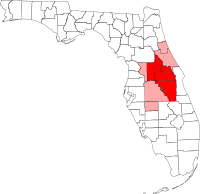 This includes the Deltona–Daytona Beach–Ormond Beach Metropolitan Statistical Area ( Volusia and Flagler counties), as well as the micropolitan area of The Villages ( Sumter County). The Combined Statistical Area was estimated to have a population of 2,818,120 in 2010. Greater Orlando is a popular tourist destination thanks to the many theme parks in the area. Famous attractions include Walt Disney World, SeaWorld Orlando and Universal Orlando. Millions of tourists visit these and other attractions every year. The citrus industry historically dominated the Orlando area economy, but has declined over the past 100 years. The Christmas 1989 impact freeze proved particularly damaging to commercial citrus farming within Greater Orlando. There are still three major orange juice plants remaining in the area: Cutrale Citrus Juices in Leesburg; Florida's Natural Growers in Umatilla; and Silver Springs Citrus in Howey-in-the-Hills. Minute Maid maintains a major juice flavoring plant in Apopka. Other agricultural pursuits, particularly cattle farming, remain important parts of the Central Florida economy, but are now all located on the outer fringes of the metro area. Orlando is also a major food processing center. Metro Orlando has served as a major military defense and aerospace center since World War II. The most prominent defense contractor in the area is Lockheed Martin, which operates both a laboratory and a manufacturing facility in Orlando. Military presence began in the 1940s, with the opening of McCoy Air Force Base and the Orlando Naval Training Center. McCoy AFB was a major hub of B-52 Stratofortress operations. McCoy AFB was split between the city and NTC Orlando in 1974, and NTC Orlando closed in the mid-1990s. McCoy AFB is now the location of the Orlando International Airport. Farther north in Sanford, the Orlando Sanford International Airport was originally Naval Air Station Sanford. Metro Orlando's economy has greatly diversified from tourism, and the area is now considered a primary city for the modeling, simulation and training (MS&T) industry. The University of Central Florida is home to more than 60,000 students, the second largest public university campus by enrollment,  and established the UCF College of Medicine in 2006. The Central Florida Research Park is the seventh largest research park in the United States by number of employees, and fourth largest by number of companies. In addition to having a Lockheed Martin branch, it also hosts other major hi-tech companies such as Oracle Corporation, Electronic Arts, and Siemens. Tavistock Group, an investment firm that held 7,000 acres (2,800 ha) of land immediately South East of Orlando International Airport began formulating new possibilities for its land use after the decline in tourism to the state. Tavistock decided to use part of the land to establish a Bio-Sciences cluster. In 2005, the state of Florida along with Tavistock Group and the University of Central Florida agreed that Tavistock would donate 50 acres (20 ha) and $12.5 Million (which the state would match for a total of $25 Million) to start the UCF College of Medicine and the Burnett School of Biomedical Sciences. The UCF College of Medicine won approval from the State Board of Governors in 2006. That decision was key to attracting Sanford-Burnham Medical Research Institute to Central Florida. Tavistock then donated another 50 acres (20 ha) and $17.5 Million to Sanford-Burnham which allowed Sanford-Burnham's East Coast expansion. The Western Expressway (SR 429), which is partially completed, will eventually serve as a beltway in the western half of the area, connecting to Interstate 4 on both ends from Sanford in the north, through Apopka and Ocoee, and around the west side of Walt Disney World to connect southwest of Kissimmee. The Apopka Bypass (SR 414), is a partial tollway beginning at US 441 Orange Blossom Trail west of Apopka to Maitland Blvd at US 441 south of Apopka. From there, the road continues as "Maitland Blvd", but is a surface road. The spur west of Apopka will eventually run north to begin the "Wekiva Expressway". The Beachline, Central Florida GreeneWay, East-West Expressway and Western Expressway are all run by the Central Florida Expressway Authority. Florida's Turnpike and portions of tollways not inside Orange County are run by Florida's Turnpike Enterprise, a special district of the Florida Department of Transportation. Major surface highways include US 17, US 92 and US 441 (which overlap through Orlando as Orange Blossom Trail), US 27 (Claude Pepper Highway), US 192 (Irlo Bronson Highway), SR 50 (Colonial Drive and Cheney Highway), John Young Parkway, and International Drive. Some state highways and toll roads in the Orlando area are four hundred digit numbering which is similar to what's used in Ontario's 400 series highways. Bus transportation in Orange, Osceola, and Seminole counties is provided by LYNX. LYNX operates 88 routes as of January 28, 2019. LYNX provides service on local, limited-stop (FastLink), and neighborhood, on-demand circulator routes (NeighborLink). Lynx had express routes into Cleremont and Volusia County, but these were eliminated in 2014 due to the opening of SunRail. Volusia County is primarily served locally by Votran and Lake County is primarily served locally by LakeXpress. The SunRail opened for operation in 2014 and the second phase expansion into Osceola County opened on July 30, 2018. The terminal stations are currently at Poinciana and DeBary. Studies are being conducted to extend SunRail to Orlando International Airport (OIA) and Deland. SunRail (formerly referred to as Central Florida Commuter Rail) is a commuter rail system in the Greater Orlando, Florida area, linking Poinciana to DeBary through Downtown Orlando. Phase 1 opened in May 2014, and ran between DeBary and Sand Lake Station. Phase II opened in July 2018 and extended to Poinciana through Osceola County with the addition of four new stations. Church Street Station, once a stop along the Atlantic Coast Line Railroad, has since been redeveloped as an urban night life center, while the station itself will serve as Downtown Orlando's centerpiece SunRail stop. Amtrak serves stations in the area in Kissimmee, Orlando, Winter Park, Sanford and DeLand. The Sanford station is the southern terminus for the Auto Train, which transports people and their vehicles, without intermediate station stops, directly to Washington, D.C., via Lorton, Virginia. The other stations are served by the Silver Meteor and Silver Star, which both travel to New York City. The difference between the two lines is their paths through the states of South Carolina and North Carolina: Silver Meteor takes a coastal route through Charleston, South Carolina, and Fayetteville, North Carolina, while Silver Star moves inland through Columbia, South Carolina, and Raleigh, North Carolina. Orlando will be served by Virgin Trains USA (formerly Brightline) at Orlando International Airport's new intermodal terminal. Current service runs from Miami to West Palm Beach, with construction to Orlando to begin in March 2019. In addition, an extension of Virgin Trains to Tampa is also proposed. The primary major airports of the area are Orlando International Airport, at SR 528 Exit 11/SR 417 Exit 17, and Orlando Sanford International Airport, at SR 417 Exit 49. Orlando International (MCO) is a focus city of JetBlue Airways and Southwest Airlines. AirTran Airways was headquartered in Orlando and had a major hub in Orlando but it was merged into Southwest. JetBlue Airways also has a training facility known as JetBlue University, and is the main training center for JetBlue’s pilots, inflight crew, plus support training for its technical operations and customer service crew. JetBlue also provides general aircraft maintenance and LiveTV installation and maintenance in Orlando. Orlando Sanford International (SFB) is generally served by charter flights from Europe, though it is also a hub for national small-city carrier Allegiant Air and home to Delta Connection Academy, a pilot training school. In the Combined Statistical Area, Daytona Beach International Airport and Leesburg International Airport also serves the area, and is used by many tourists seeking to directly connect to Daytona Beach's many local offerings, such as Daytona Beach Bike Week, Speedweeks and Spring Break. It is located so its runways cradle Daytona International Speedway, making it convenient for some fans to arrive in Daytona, watch the Daytona 500 or Coke Zero 400, and then return home the same day. Daytona Beach International also serves as the main airport for pilot training at Embry-Riddle Aeronautical University. Municipal airports in the region include Orlando Executive Airport, Kissimmee Gateway Airport, Ormond Beach Municipal Airport and DeLand Municipal Airport. The primary newspaper of the area is the daily Orlando Sentinel, owned by Tribune Company. It was created as the Orlando Sentinel-Star in 1973 when the Orlando Morning Sentinel and the Orlando Evening Star were merged. It dropped "Star" from the name in 1982. It is also served by various weekly and semi-weekly papers, including Orlando Weekly, The West Orange Times, The East Orlando Sun and The Osceola News-Gazette in Kissimmee. The extended area is also covered by The Daytona Beach News-Journal and Florida Today. All six major broadcast networks are represented in Orlando with their own channels. WESH brought NBC to Orlando when it moved its main operations from Daytona Beach to Eatonville in 1991. ^ a b c d "OMB Bulletin No. 10-02: Update of Statistical Area Definitions and Guidance on Their Uses" (PDF). United States Office of Management and Budget. December 1, 2009. Retrieved August 3, 2010. ^ Pedicini, Sandra. "Visit Orlando: Record 68 million people visited last year". orlandosentinel.com. Retrieved 26 March 2018. ^ "Timeline of Major Florida Freezes - Florida Citrus Mutual". flcitrusmutual.com. Retrieved 26 March 2018. ^ "Freshman Class Sets New Records, Fall Enrollment May Top 60,000". UCF News - University of Central Florida Articles - Orlando, FL News. Retrieved 26 March 2018. ^ "Office of the Mayor". City of Orlando. Archived from the original on January 17, 2013. Retrieved September 13, 2013. ^ MacCash, Doug (April 1, 2017). "Return of an Amtrak train to Orlando in further doubt". The New Orleans Times-Picayune. Retrieved October 24, 2018. ^ Peltier, Michael (February 16, 2011). "Florida governor slams brakes on high-speed rail". Reuters. Retrieved October 24, 2018. ^ "Dr. Sun's Monument Unveiled at Orlando Chinatown". Archived from the original on 2015-02-02. ^ "Orlando China Town - Best Shopping & Doing Business". orlandochinatown.com. Retrieved 26 March 2018. ^ "First comes 1st in new Chinatown". ^ "Asian-Themed Shops, Restaurants to Create Chinatown in Orlando, Fla". Archived from the original on 2015-09-24. ^ "Orlando Chinatown: A New Venture for Chinese Americans". ^ "What People Watch, Listen To and Buy - Nielsen". nielsenmedia.com. Retrieved 26 March 2018.